Back in the the early 90s, UK magazine The Face was the coolest thing on the planet. In this magazine, Eva Herzigova was photographed as a butcher. Eva Herzigova, blood-smeared, washed out and holding a lump of bloody mince meat. 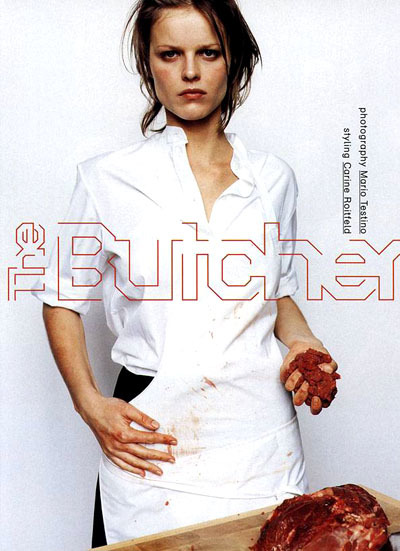 A hilarious shoot, which cast supermodel Eva Herzigova as a maniacal butcher in a blood-spattered apron playing with pieces of raw meat, also drew flak, particularly the image of her caressing the blade of her meat cleaver. These images were created for a Mario Testino portfolio in collaboration with Carine Roitfeld in The Face magazine circa 1997. “The Butcher” shoot with Eva Herzigova depicts two combining instincts: irreverence and provocation. One of the coolest magazines to come out of the UK, The Face was launched by Nick Logan in May 1980, and last published in May 2004. Legendary as an arbiter of taste in pop culture and particularly fashion, The Face was a natural stage for the vision of Roitfeld and Testino which was especially raw during this period — literally at times. Ezra [Self Service]: Your early collaborations with Mario Testino were quite provocative in a certain way! Carine: I think that in the beginning of my love duo with Mario, we did a few series that really disturbed people. Ezra: Such as some of the stories you did with him in The Face? Carine: Yes, for example, and I think that we had a lot of humor. We were talking about the problem of the moment, which was mad cow disease. Ezra: And the other one on royalty. Carine: I think you need humor, there is not a lot of it in photos, and it’s very hard to put humor in photos. In any of Rotfield’s issues of Vogue Paris it can be seen she still makes subversive choices. And under her editorship, Vogue Paris has become a space where she and her collaborators (Emmanuelle Alt, Juergen Teller, Mario Testino, Terry Richardson) examine the cult of celebrity, art, stereotypes, glamour, scandal, dignity and infamy. * “No one can be wise on an empty stomach” written by George Eliot, the pseudonym of novelist, translator, and religious writer Mary Ann Evans (1819-1880).